Mitsubishi Motors CEO Osamu Masuko, left, and Mitsubishi Motors Chairman Carlos Ghosn, right, on Friday in Tokyo. TOKYO -- Mitsubishi Motors will tap new growth in the United States and China by using the Renault-Nissan "toolbox" of products, technologies and factories, top executives said. Mitsubishi has been unable to gain sufficient traction in the world's two biggest auto markets because it has been short on resources, Mitsubishi Motors Chairman Carlos Ghosn said. That will be remedied now, Ghosn told reporters at a press conference here Friday in advance of the automaker's annual shareholders meeting. "A lot of this potential depends on new products," Ghosn said of Mitsubishi's turnaround. "There are a lot of needs which have not been addressed by Mitsubishi because Mitsubishi doesn't have the technology or doesn't have the segment or did not have the platform." 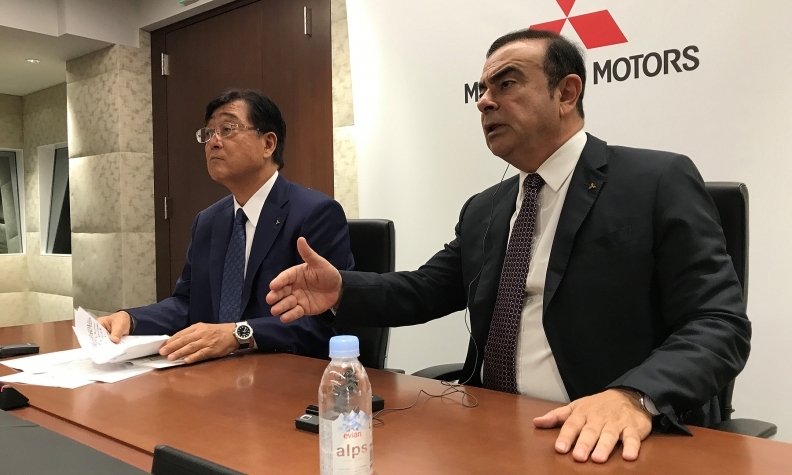 He said Mitsubishi will lean heavily on resources from the Renault-Nissan Alliance, the global cross-ownership arrangement that struggling Mitsubishi was brought into last year when Nissan took a controlling 34 percent stake in its smaller Japanese rival. Ghosn promised a V-shaped recovery for Mitsubishi, which saw profits plunge last year amid a scandal over faked fuel economy ratings. That crisis opened the door for Ghosn, who was then joint CEO of Nissan and Renault, to orchestrate the Mitsubishi takeover and appoint himself its chairman. Its recovery plan has begun by focusing mostly on business in Southeast Asia, where it already has deep roots. But going forward, it will concentrate more on the U.S. and China, Ghosn said. Expanding there is key because of the vast size of both markets. Ghosn promised results, particularly in China, as early as next year. "Without any doubt, for me, the potential of development and growth of Mitsubishi in China is very big, and hopefully you will see it immediately, not five years down the road. You're going to see it next year and the year following," said Ghosn, flanked by Mitsubishi CEO Osamu Masuko. "Also, the potential of development of Mitsubishi in the United States is very big." Neither Ghosn nor Masuko offered details about what lineup holes Mitsubishi needs to plug. But Masuko said electrified vehicles and crossovers will be the focus going ahead, and Ghosn said the alliance intends to commonize EV components to maximize cost and r&d efficiencies. Masuko also said he hopes to tap the global production network of Renault and Nissan. "We are thinking of using the facilities of Renault or Nissan eventually if it makes sense," he said, without referring specifically to Nissan's plants in the United States and Mexico. "Now being part of the Renault-Nissan Alliance, we can use their toolbox." Under the comeback plan, Mitsubishi aims to boost its annual worldwide volume to 1.25 million vehicles in the fiscal year ending March 31, 2020, up from about 1 million today. China will figure prominently in that plan. Masuko wants to more than triple Mitsubishi's China sales to 300,000 vehicles a year in the early 2020s, from fewer than 100,000 in the fiscal year just ended, by introducing new products and expanding the dealer network. Meanwhile, despite similarly modest volume, the U.S. remained Mitsubishi's single biggest market last year. In the fiscal year that started April 1, Mitsubishi expects sales for the North America region to advance 3 percent to 148,000 vehicles.